Sorry for the wait America, I know you've been itching to read my latest post. No worries, the wait is over. My weekend was spent in the "bee-yoo-tee-full" city of Chattanooga, Tenn.
On Friday I hoofed it across Missouri, Kentucky and Tennessee to arrive at the Riverbend Festival in the early evening. If you take a look at my photo diary, you'll see a few shots that barely capture the sea of more than 100,000 people who attended that night. 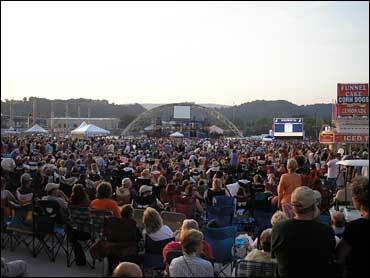 The Riverbend Festival is a huge draw, with upwards of 750,000 festival-goers expected over nine days and nights. Five stages and non-stop music from headliners that include the likes of Kenny Rogers, Sugarland, Trisha Yearwood and the Allman Brothers Band provided the entertainment this year. So who managed to draw more than 100,000 people on Friday? Why none other than country royalty, Hank Williams, Jr. His brand of gritty, honest and at times (achem) slightly uncouth lyricism mixed with an edgier country-rock sound has earned him a tenacious and loyal following. Being the son of country music legend Hank Williams, Sr. doesn't hurt either. He packed the Riverbend Festival and few if any left disappointed ... or sober. Don't worry though, Chattanooga is a pedestrian-friendly city. The flavor of Hank's music and his followers washed over me that night. I'm a changed man. "How you doin" has officially become "How ya'll doin." Will the North ever take me back? Tomorrow night, the coordinating staff of the Riverbend Festival will help me get "The Early Show Winnebago on the fairgrounds and get me backstage. I'll have an opportunity to see the show facing the crowd instead of in the midst of it. I've been promised a full tour of the behind-the-scenes workings of this massive event. The incredible thing is just eight coordinators managed to put this behemoth of a Festival together for the city of Chattanooga. Well, maybe I should say 1,208 coordinators. The Riverbend Festival drew 1,200 volunteers this year. That's right, one-hundred dozen good-hearted citizens dedicated their time and effort to give their city this gift. I have to thank Sallie, Barbara, Chip and especially Susan for giving me the keys to Riverbend; their hospitality has been overwhelming. Thanks to the free hors d'oeuvres and picturesque views of the Tennessee River, it rated a solid 8.5 on my "Fun-o-Meter." In Chattanooga, a city of only 160,000 people, any event that draws five times the city's population is going to draw vendors, too. I had the chance to meet one of these street vendors. Her name was Megan. Some individuals would rightly see the festival as an opportunity to make some quick dough, others though saw it as an opportunity to make ends meet. Megan wasn't hard to find amongst the throngs of visitors. She and her teenage son were selling a variety of battery-powered light toys as dusk fell on the festival. Flashing wands, flickering plastic swords and glowing glasses were draped across their bodies like some neon-Samurais readying for battle at the local arcade. It was hard not to watch Megan's animated efforts as she attempted to sell her product. I couldn't resist approaching her, so I politely asked if I could take her picture, explaining it would be on my "Great American Vacation" Web journal. Along with her permission came a short story about her life and her current and difficult position as a single, out-of-work mother trying to make rent. I was astonished by her candor as she painted a sobering picture of a reality I had never encountered nor experienced firsthand. Megan was a hard worker with little pride but an abundance of dignity. I could offer her nothing more than my kind words of encouragement and $10 for a flickering sword. I truly believe her dedication to her son will get her through her troubles. Everyone knows there are those who are less fortunate. It's a fact of life, but when you walk right up to it, "it" has a face and a name and a kid. In a thriving city with so much culture and growth, it's easy to forget no place is perfect. Megan's sense of duty to her family fit right in with Chattanooga, although I've never been in a city that so effortlessly captured the feeling of family. Today I awoke to another flawless azure blue Tennessee sky. My 6th floor balcony at the Chattanooga Choo Choo Holiday Inn (home of the actual Chattanooga Choo-Choo train) overlooked a fountain-brimmed pool with a Jacuzzi gazebo smack dab in the middle. Fine time for a morning swim? Nope, there was still plenty of city to explore. Southern Belle, Chattanooga's Riverboat, the Hunter Museum of American Art which houses one of the world's largest collections of American Art or the gorgeous Tennessee Aquarium, the mysterious architectural wonder that served as the backdrop of so many of my photos. I'm a sucker for animals so I ventured back to the riverfront with my "Winny." No more than two minutes after I parked in a great photo location, a smiling Aquarium employee approached me and began to ask the usual questions one might expect to receive while driving around in a 23-foot Winnebago covered in CBS' Early Show and "Great American Vacation" decals. A few Q&A's later and Lisa, the lovely senior marketing manager of the Tennessee Aquarium, and I were having lunch. Whoo-hoo! It's gotta be the Winnebago. After a tasty tuna steak sandwich (is that awful?) Lisa offered to take me on a personal tour of the Aquarium. What a treat!!! The most fascinating thing about the Tennessee Aquarium is how it presents it exhibits. The story follows a raindrop from a simulated (but completely alive) indoor Appalachian cove forest right down to the equally real coral-reef waters of the Gulf of Mexico. Along the way you see more than just fish; a butterfly room, alligators, river otters, rays, hyacinth parrots, turtles of every kind, leafy sea dragons, octopus, sharks, too much too list! It was brain candy. It was eye candy. It was impressive. It was well worth the $17.95 adult admission. One of the most charming creatures living at the aquarium was a curious and troublemaking blowfish. This round-eyed, beach ball-sized underwater buoy is such a curious troublemaker, in fact, that every once in a while he needs a "time-out" from his tank which he shares with dozens of other fish -- including a couple of 10-foot-long sand tiger sharks. Apparently this fearless "puppy dog" blowfish, according to Lisa, will sometimes nibble and poke the sharks to the point of provocation. For his safety, and the sharks' as well (he is a blowfish covered in quills), he needs to be separated until he learns to behave. That made me laugh ... hard. After a few hours at the aquarium and a woeful goodbye to my friends at the Riverbend Festival, I secured my belongings and stowed my souvenirs in the overhead compartments. I returned my seatback and tray to their original and upright positions. I properly fastened my safety belt and took off down the highway in my Winnebago towards Quincy, Ill., via Nashville, Tenn., and who knows where else. See you in St. Louis.